What are you volunteering as here? I am in the medical team and I am currently getting a back rub. Have you volunteered before? I have! I was working with a USA team at Lecco last year. What brought you here then? An American player posted it to me on Facebook since he knows I am a physio and I was like: Dubai why not! I applied and WFDF got back to me and invited me down. Enjoying it? Yeah! Loving it! What is your team like here? We have a well-rounded team. In the States we have athletic trainers who do strappings, tapings and emergency response. 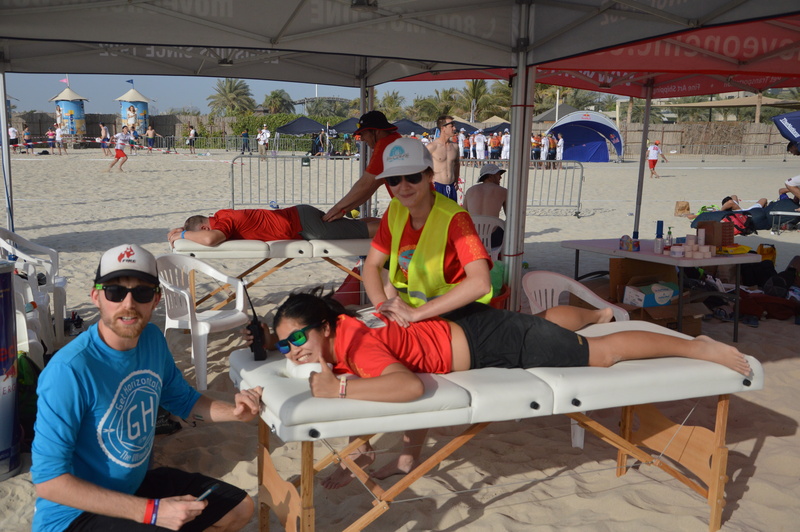 Then we also have physical therapists – rather than physios – who do more like assessments and massage things. But here we fill out the team well with two of either of those. Thanks very much and good luck with the rest of the tournament! This Beach Tale was brought to you by David “DP” Pryce of Get Horizontal.